I try climbing up and down on the table in front of the TV. Will I succeed without hurting myself? iTune in to find out! 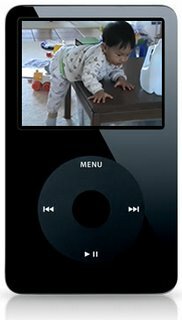 Also in the news are rumors of yet another new video iPod. From what I've heard, they're thinking of making it a bigger screen and that it would also be a touch-screen. So it may be goodbye to the click-wheel, or perhaps there will be a 'virtual' click-wheel on the screen. We'll see. Don't forget to tell your friends about me, and subscribe through iTunes!